Members of the Gallia Academy volleyball team pose for a picture after winning the Circleville Tournament on Saturday. Kneeling in the front row, from left, are Katie Carpenter, Taylor Burnette and Ryelee Sipple. Standing in the back row are assistant coach Kaci Cooke, Maddie Wright, Alex Barnes, Peri Martin, Grace Martin, Ashton Webb, Aubrey Unroe, Hunter Copley, Maddy Petro and head coach Janice Rosier. CIRCLEVILLE, Ohio — The Blue Angels certainly had a successful Saturday. 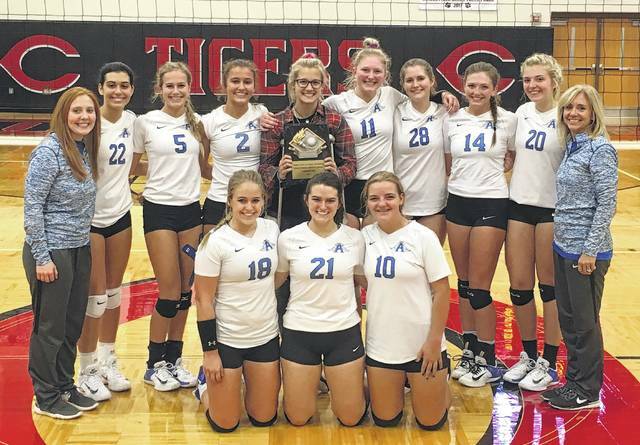 The Gallia Academy volleyball team added three wins onto its unblemished record and won the 2017 Circleville High School Volleyball Tournament on Saturday in Pickaway County after defeating Logan, Circleville and Southeastern. The Blue Angels (12-0) — winners of 34 consecutive regular season matches — got the day started on the right foot, as they never trailed in a 25-18 opening-game victory over Logan. Gallia Academy led early in Game 2, but the Lady Chiefs fought back, tied the game three times and eventually took a 16-14 lead. GAHS tied the game at 19, then again at 20 and finally took the advantage back at 21-20. LHS tied the game at 21, but the Blue Angels claimed the next four points for the 25-21 win. Peri Martin led the GAHS service against Logan, collecting nine points and one ace. Ashton Webb posted six points and five aces, Katie Carpenter added four points, while Alex Barnes had three points and one ace. Ryelee Sipple finished with two points in the win, while Taylor Burnette and Hunter Copley each had one service point. At the net, Webb and Barnes led the Blue Angels with 10 and eight kills respectively. Martin had two kills, one block and a team-best 19 assists, Aubrey Unroe added two kills of her own, while Copley and Maddie Wright each had one kill, with Wright also earning a block. Webb led the Blue and White on defense with a dozen digs in the win. Gallia Academy faced Circleville in the semifinal match and, after a pair of lead changes and a quintet of ties, the host Lady Tigers claimed a 25-21 victory in the opening game. The CHS win ended the Blue Angels’ streak of consecutive regular season games won at 56. Circleville was also the last team to win a regular season game against GAHS, winning 1-of-3 games against the Blue Angels in this event last year. Just like last season, the Blue Angels bounced back to defeat the Lady Tigers in the next game, as GAHS led a majority of the way to a 25-21 victory in Game 2. In the deciding third game, Gallia Academy led by as much as 10 en route to the 25-18 victory. Barnes led the way for the victors with nine service points, including one ace. Webb and Burnette each had eight points, with seven and two aces respectively. Copley and Sipple marked four service points apiece in the triumph, while Martin added two points. Webb led the Blue Angels net attack with an outstanding 25 kills and three blocks. Barnes and Copley both had four kills, as well as a team-high 11 digs apiece, with three blocks by Barnes and one from Copley. Martin finished with one kill and 29 assists, Wright chipped in with one kill and one block, while Unroe contributed one block to the Gallia Academy cause. In the championship match against Southeastern, the Blue Angels led initially in the first game.The Lady Panthers tied the game four times before finding their way into the lead at 11-10. Gallia Academy regained the advantage at 16-15, but Southeastern tied the game again at 18. From that point, GAHS closed the game with a 7-2 run, sealing the 25-20 win. Gallia Academy trailed only once, at 7-6, in the finale, leading by as many as seven points en route to the 25-22 Game 2 win and the 2-0 match victory. In the final match, Copley led GAHS with nine service points, including four aces. Webb had six points and four aces, Barnes and Sipple each added three points, while Martin and Burnette each had two points, with an ace by Burnette. Webb collected 13 kills and one block to lead Gallia Academy at the net. Barnes finished with four kills, Wright added three, while Burnette had one kill and one block. Martin and Copley both finished with one kill in the championship match, with Martin earning a team-best 17 assists and Copley coming up with a team-high 12 digs. After a non-conference trip to Meigs on Monday, GAHS will get back to business in the Ohio Valley Conference on Thursday when the Blue Angels host Fairland.